Sarah & Tom have been taking the animals to residential homes since they started the business. In homes for clients with disabilities, it is a hassle-free visit to a farm! 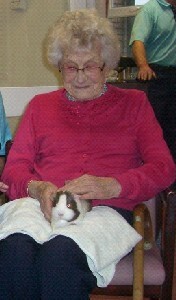 In homes for older people, it is an ideal way to relive memories as well as enjoy the therapeutic experience of holding or stroking an animal. It is also an excellent opportunity for residents to share stories with us about their experiences in farming or about their own pets. Usually visits are two hours long, although clients are free to book us for longer. We usually set the larger animals up outside, and if the weather isn't conducive for the clients to come outside, we set up the smaller animals inside. 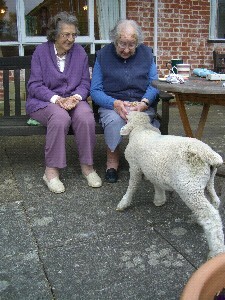 MCFE staff then take the animals around to each resident, chatting informally to each person as they go. We are happy to visit residents unable to leave their rooms as long as a member of the residential home staff is present too. In the winter months (October-February inclusive), when residents would prefer not to go outside, we can offer a Small Animals only visit for a discounted rate. This would involve one staff member bringing out our smaller animals such as guinea pigs, rabbits, chicks and the dog for the residents to handle. Contact us for more details on residential home visits!